"My third kitchen from Richfield's Interiors, just wanted to say how pleased we were with both the quality of the kitchen and the caring attitude of the fitters - nothing was too much trouble! I would definitely recommend! "Just wanted to do this review to say thanks for the lovely kitchen which Richfields Interiors did for us.The Quality, Design and the fitting was first class (5 Star). 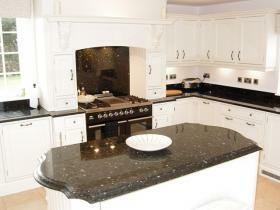 Would strongly recommend them to anyone who wanted a first class kitchen ,you have people here who you can trust." 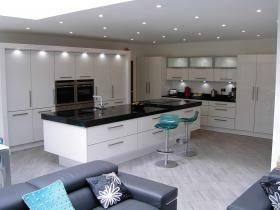 "I have just had my new kitchen fitted and it looks amazing. They were helpful from start to finish. After a previous bad experience with a sales person, Richfield Interiors were totally honest and refreshing"
"Having spent some time investigating and visiting many Kitchen Companies in Sutton Coldfield, Solihull and South East Birmingham, we found Richfields was the only company who could offer exactly what we wanted. Having saved for some time, we felt it was important that we made the correct decision and as the kitchen has now become the focal point of most houses, we didn’t want to settle for second best and then have to live with the regrets. The design was excellent and with Richfields expertise, they were able to offer ideas that we had not considered. The team that carried out the work were brilliant, each extremely competent in their particular trade. Furthermore, they were polite, pleasant and considerate keeping us informed about the work they were about to carry out. Nothing was too much trouble as they were prepared to go the “extra mile”. A great credit to British workmanship! I would sum up by saying, if you want “cheap and cheerful”, then Richfields may not be for you, but if you want your friends and neighbours to go “wow” when they see your new kitchen then I would recommend you visit Richfields." "I shopped around and was pleased with the quote from Richfields at their Church Gresley Showroom. I am very indecisive when choosing things and appreciated the help given when planning my kitchen.The quality of everything and service given is excellent. All the workmen were great and the kitchen was fitted in less than a week even though I changed my mind on a few things on the way !! I am delighted with my new kitchen." "Had been searching for a new kitchen for over a year (driving my husband round the bend), happened across Richfield Interiors showroom in Sutton town centre purely by accident and fell in love with a painted kitchen on display there. After a couple of revisits my husband and I placed an order and we have been positively delighted with the finished results. All workmen were a joy to have in the house. 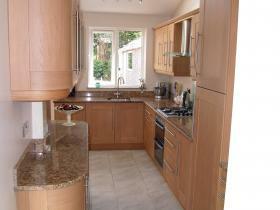 My kitchen has been transformed from the mess it once was to a beautiful high quality kitchen." "Having purchased a kitchen from Richfields Interiors, which is now approximately two years old, I thought it may be useful to comment on the experience to date. The company provided a prompt and efficient service from design through to delivery. Bespoke units from their on-site factory are robust and expertly assembled; they still look as good as new. Any minor problems were attended to quickly by skilful and friendly staff. This is to be expected from a well run family business with a longstanding reputation to preserve. We would use them again and recommend to friends." 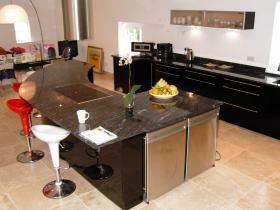 To view some of our latest luxury Kitchen and Bedroom Installations, view our Portfolio. Contact Us today to start planning your Bespoke Kitchen Fitting. We make use of extensive design and planning, and use only the highest quality of Craftsmanship to design and create your dream Bespoke Kitchen and only use our highly qualified installation team to ensure the finest possible finish. Call us today on 0128 322 5014, email us at sales@richfieldsinteriors.com or fill out our Enquiry form and we'll be in touch. © Copyright Copyright Richfield's Interiors 2019. All rights reserved.